Every park refuge, in season, offers meals and has a small shop. However, you will find that the meals and produce for sale, varies enormously in every place. The offer is influenced by the refuge’s location, when and how it was last re-stocked and whether the guardian has a second activity, that might influence the produce he sells. A lot of people choose a compromise between ordering an evening meal prepared by the guardian some nights and buying food to prepare themselves on others. Nobody wants to be weighed down carrying all their meals, but ordering breakfasts and evening meals daily is a considerable budget. You often hear complaints that there is too much food repetition, not enough bread, or fresh fruit available. However, given the limited facilities that the guardians have for getting the supplies in and for the cooking, the food is pretty good. They also have to select produce that is going to resist the strong heat. You will find apples, oranges and tomatoes for sale and the vegetables are abundant in the Corsican soup which is a favourite starter. During the months of June, July, August and September, the refuges offer a breakfast and evening meal that you can order upon arrival mid afternoon. The breakfasts are often prepared the night before and handed out so that you can leave as early as you want in the morning. 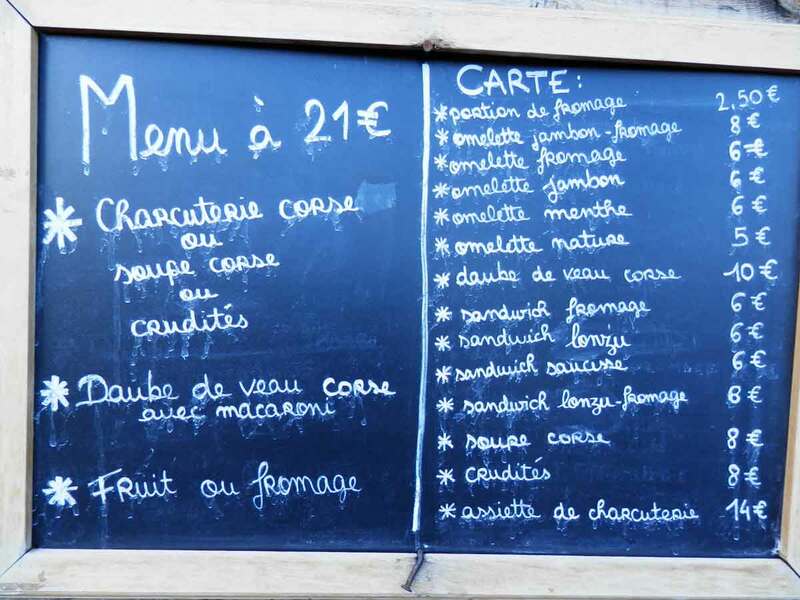 If you are passing a refuge between 12h and 14h they often offer a small lunchtime menu with choices, such as, cheese and mint omelette, pasta, Corsican soup, and plates of smoked charcuterie. If you order an evening meal, they tend to be served from 19h00 and there are often two sittings depending on the amount of walkers present. This will be three courses which is different in every nightstop. You need to reserve as soon as you arrive, don’t leave it too late. You will be expected to bring your own knife to mealtimes! All refuges have an indoor kitchen that you can use. It will be equipped with gas, water and kitchen utensils. (Always keep a lighter, or matches with you.) You might find there are only 4 gas rings available for a large volume of hungry people, patience is needed. You have to survey your pots and pans, if you turn your back on boiling water, chances are it will go on somebody else’s pasta! You are asked to wash and dry anything you use. Every refuge has an additional outdoor kitchen for campers. The guardians sell products that won’t go off quickly and will survive a journey. The majority of refuges bring in produce by helicopters several times during the season and replenish during the summer by using mules and carrying produce in by foot. The prices are reflected in the difficulty this entails. There are natural fresh water springs outside all of the refuges. I systematically filled up with two liters of water before leaving every morning and sometimes at midday. I used a water pouch with pipe. There are often springs along the way but not always. You will see springs marked on the map with a small blue tear. On the ground, they are sometimes indicated with a sign and you will find a black pipe has been inserted to make it easier to fill up. You should never drink directly from the rivers. It is well worth carrying a packet of water purifying tablets, in case you are on a long section where there are no fresh water springs. You will always find water that can be made safe by using a purifying tablet. Another popular starter is 'Assiette de charcuterie' or dried pork. This is also a good picnic option because it doesn't go off and its easy to transport. The charcuterie is produced locally and is one of the best in the world, the pigs are free range, they have a good diet and the meat is dried for months, so it won't go off in your rucksack. Coppa and Lonzu - are quite different, they are made from different parts of the pig. The coppa is a combination of meat and fat, whereas the lonzu is a lot leaner. There is a long tradition of sheep and goat rearing on the island, there is a lot for sale and a lot incorporated in the meals on the GR20. Generally, the cheese is either brebis (ewe's milk) or chevre (goat's milk.) Then the family name of the producer is given to the cheese. You will come across brocciu, this is a whey cheese akin to ricotta. It's creamy and is often on the menu in cheese and mint omelette, or cannelloni stuffed with brochiu and mint. These are two great local beers, Pietra was the first beer to be brewed with a mix of chestnut flour and barley malt. Corsicans and visitors alike, love it. it is amber in colour and has a strength of 6%. 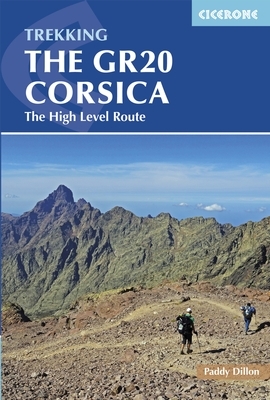 Sold throughout the GR20, it's expensive and worth it! The Colomba beer has captured the taste of the maquis, it has a subtle, herby, aromatic taste of juniper and myrtle, it's paler in colour than the Pietra, almost white and has 5% strength. There are a lot of ravenous pigs wondering around on the GR20, they will find food if it’s lying about. Be canny with your rucksack during the day, you can always hang it in a tree if there is food in side and you are leaving it for a few minutes. I have seen pigs run off with bags into the dense maquis, never to be found again. If you have passports, keys and other valuables inside, it can be a real drama. If I had any left over picnic, I would throw it under a bush where it wasn’t unsightly and an animal could eat it. I would take orange or banana peels with me to the next refuge. At the time this was written, there were bins available at each refuge, you do not have to carry out your empty tins and packets. In some refuges you are asked to divide your waste into different bins. It’s worth bringing a couple of zip lock bags to help carry your picnic food.